I mean, really... This sandwich will murder any sandwich you've ever loved. Hands down. It isn't entirely my own creation, I found and modified the recipe from theKitchn.com, however, I am completely confident mine is better. 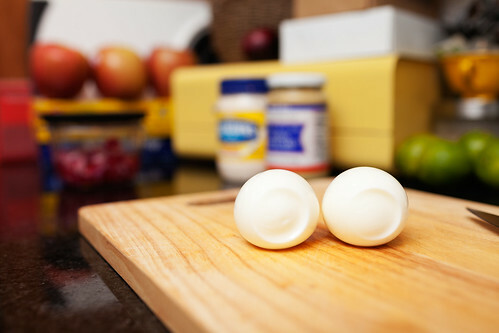 I soft boil two eggs and set them aside so they can cool. As a rule after boiling eggs, I crack the shell to make sure the peeling process isn't a pain after I've placed them in a bowl of cool water. It always helps. I cut my asparagus into slices length–wise using a paring knife and place them in a skillet over high heat with oil and minced garlic. 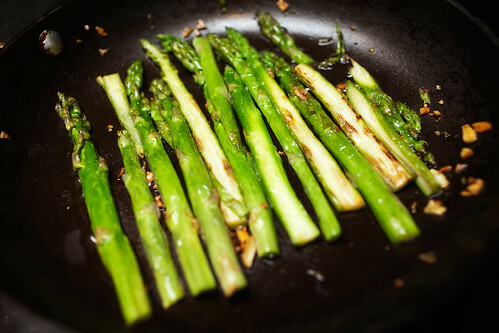 After searing the asparagus spears for about 6-8 minutes, they should be charred and delicious. 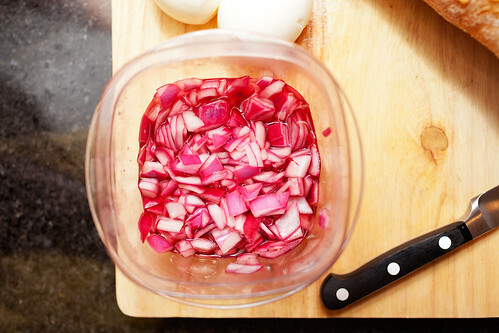 Earlier in the day, I dice about half of a red onion and put it into a container with vinegar so it can pickle as much as possible. I suggest an hour or more if you have the time! I've tried it with both apple cider and red wine vinegar, both were great. 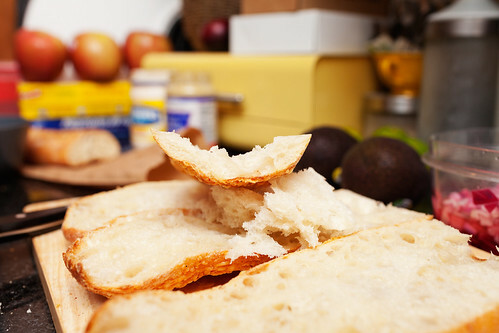 I cut one large baguette in half and remove the center so all of my toppings won't slide out while eating. Once the bread is hollowed out, I spread mayo and dijon mustard generously. 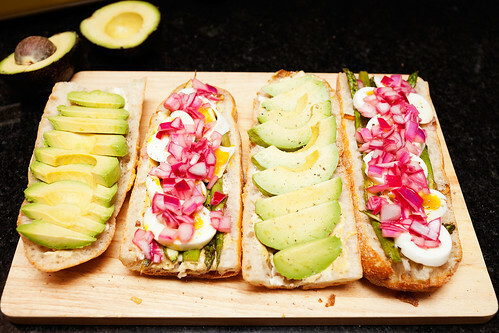 Each sandwich is topped with one sliced egg (careful if you soft boil yours, they will be gooey), 1/2 of the asparagus, 1/2 of a sliced avocado and a generous amount of your pickled red onions. Season with a dash of salt and fresh pepper. Andrew and I have eaten these sandwiches for lunch and dinner about 10 times in the last two months. They're that good. Plus, avocados just make everything better. WOW, this looks amazing! 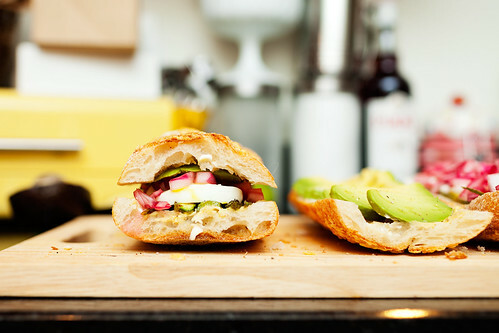 the avocado + the baguette ALONE makes me drool. lol! Must try. thanks for sharing! Oh, I'm sure you're going to love it! Totally drool-worthy. Yum! What a wackadoo combination- but it sounds amazing! It's really strange how great everything tastes together, try it for yourself! That is one of the most beautiful sandwiches I have ever seen!!!! Avacados make the world a much happier place.^_^ totally getting an avacado tattoo when I get the fundage. Amazing! Can't wait to try this out and SOON. Looks delicious. Not something I would think to put together. Me neither, normally I hate pickled things. Onions and radishes are now the exception. Looks yummy, I'll have to try it. and you're totally right, avocados do make everything better. omg this looks so delicious. heading to the supermarket right now to buy supplies!